Through AdSense for Search, Google provides these search adverts to owners of “publisher” websites. Google is an intermediary, like an advertising broker, between advertisers and website owners that want to profit from the space around their search results pages. 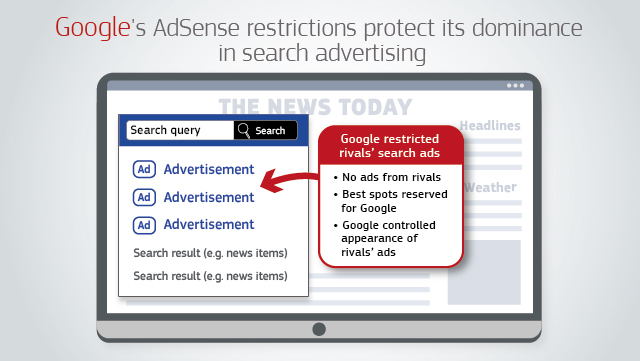 Therefore, AdSense for Search works as an online search advertising inter-mediation platform. Google was by far the strongest player in online search advertising inter-mediation in the European Economic Area (EEA), with a market share above 70% from 2006 to 2016. In 2016 Google also held market shares generally above 90% in the national markets for general search and above 75% in most of the national markets for online search advertising, where it is present with its flagship product, the Google search engine, which provides search results to consumers. It is not possible for competitors in online search advertising such as Microsoft and Yahoo to sell advertising space in Google’s own search engine results pages. Therefore, third-party websites represent an important entry point for these other suppliers of online search advertising inter-mediation services to grow their business and try to compete with Google. As of March 2009, Google gradually began replacing the exclusivity clauses with so-called “Premium Placement” clauses. These required publishers to reserve the most profitable space on their search results pages for Google’s adverts and request a minimum number of Google adverts. As a result, Google’s competitors were prevented from placing their search adverts in the most visible and clicked on parts of the websites’ search results pages. Therefore, Google first imposed an exclusive supply obligation, which prevented competitors from placing any search adverts on the commercially most significant websites. Then, Google introduced what it called its “relaxed exclusivity” strategy aimed at reserving for its own search adverts the most valuable positions and at controlling competing adverts’ performance. Google’s practices covered over half the market by turnover throughout most of the period. Google’s rivals were not able to compete on the merits, either because there was an outright prohibition for them to appear on publisher websites or because Google reserved for itself by far the most valuable commercial space on those websites, while at the same time controlling how rival search adverts could appear. Google’s practices amount to an abuse of Google’s dominant position in the online search advertising inter-mediation market by preventing competition on the merits. Today’s decision concludes that Google is dominant in the market for online search advertising inter-mediation in the EEA since at least 2006. This is based in particular on Google’s very high market shares, exceeding 85% for most of the period. The market is also characterised by high barriers to entry. These include very significant initial and ongoing investments required to develop and maintain general search technology, a search advertising platform, and a sufficiently large portfolio of both publishers and advertisers. Google has abused this market dominance by preventing rivals from competing in the online search advertising inter-mediation market. Based on a broad range of evidence, the Commission found that Google’s conduct harmed competition and consumers, and stifled innovation. Google’s rivals were unable to grow and offer alternative online search advertising inter-mediation services to those of Google. As a result, owners of websites had limited options for monetizing space on these websites and were forced to rely almost solely on Google. Google did not demonstrate that the clauses created any efficiencies capable of justifying its practices. The Commission’s fine of €1 494 459 000 (1.29% of Google’s turnover in 2018) takes account of the duration and gravity of the infringement. In accordance with the Commission’s 2006 Guidelines on fines, the fine has been calculated on the basis of the value of Google’s revenue from online search advertising inter-mediation in the EEA. Google ceased the illegal practices a few months after the Commission issued in July 2016 a Statement of Objections concerning this case. The decision requires Google to, at a minimum, stop its illegal conduct, to the extent it has not already done so, and to refrain from any measure that has the same or equivalent object or effect. Today’s decision is addressed to Google LLC (previously Google Inc.) and Alphabet Inc., Google’s parent company. The Commission’s investigation into the conduct covered by the present decision began as part of the broader Google Search investigation (case 39740). On 14 July 2016, the Commission sent a Statement of Objections to Google setting out its preliminary views that the company had abused its dominant position by artificially restricting the possibility of third party websites to display search advertisements from Google’s competitors. Article 102 of the Treaty on the Functioning of the European Union (TFEU) and Article 54 of the EEA Agreement prohibit the abuse of a dominant position.